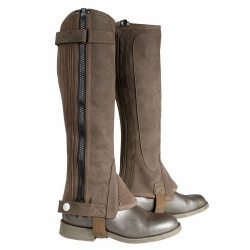 Young riders will love these leather-like half chaps for schooling in total comfort. Horze pays special attention to detail when creating these half chaps for juniors to make certain the fabric used is high grade for dependability, longevity and comfort. The natural Amara leather-like product is similar in structure to natural leather but is completely synthetic. The microfiber suede texture is soft, durable and tear resistant with high tensile strength that maintains its shape and tackles rigorous use with ease. These half chaps form easily to the natural contour of the lower leg for a snug fit. A durable, full-length YKK zipper placed between the stretch panels keeps the position secure. The top features a Velcro strap to adjust for a custom feel while a bottom strap overlaps the locked zipper for safety, snapping tightly in place. Keeping the rider's comfort in mind, inner panels prevent rubbing and provide superior grip even in wet conditions. Amara Fabric: 65% Nylon and 35% PU leather. Hand or machine wash at 40°C. Use normal detergents that do not contain bleach or fabric softeners. Air dry only, do not tumble dry.